Many kidney transplant patients experience an increase in proteinuria when converted from a calcineurin inhibitor–based regimen to one based on a mammalian target of rapamycin (mTOR) inhibitor, and preexisting proteinuria and poor renal function have been identified as risk factors for this increase. Our aim was to evaluate the effect of sirolimus, an mTOR inhibitor, on renal function and histology in a proteinuric model of reduced renal mass. Sirolimus-treated animals had approximately half as much proteinuria as vehicle-treated animals (P < 0.05), and had less glomerulosclerosis, tubular atrophy, interstitial fibrosis, and inflammation. Immunohistochemistry showed that sirolimus attenuated the increased expression of renal vascular endothelial growth factor (VEGF), as well as the expression of VEGF receptors 1 and 2. In conclusion, sirolimus halted the progression of proteinuria and structural damage in a rat model of reduced renal mass, possibly through a reduction in renal VEGF activity. The mTOR inhibitor (mTOR-I) sirolimus can be used as base or concomitant immunosuppressive treatment in solid organ transplantation and offers the potential of potent immunosuppressive treatment without calcineurin inhibitor–like toxicity.1–3 Furthermore, mTOR-I have gained attention for their antiproliferative properties.4 An increase in proteinuria was observed in many patients who were converted from a calcineurin inhibitor–based regimen to an mTOR-I–based regimen.5,6 Although several risk factors for the increase in proteinuria after conversion, such as preexisting proteinuria and poor renal function, have been identified, possible pathomechanism are still being investigated and remain unclear.7–9 It has been suggested that one of the possible pathomechanisms of mTOR-I–associated proteinuria might involve the vascular endothelial growth factor (VEGF).8,10 VEGF is a factor of endothelial cell survival, endothelial repair, and angiogenesis.11,12 In a remnant kidney model, VEGF is overexpressed in the early phase, leading to hypertrophy of the remaining tissue and consequent impairment of renal function. This can be prevented by early VEGF antagonism.13 Conversely, late after renal mass reduction, the VEGF system is downregulated and external VEGF application improves renal function.14 Thus, the VEGF system is regulated according to specific pathologic situations. In humans, VEGF antagonism as part of treatment for malignant tumors can lead to proteinuria,15 but also high VEGF concentrations—as observed in colorectal cancer—lead to proteinuric nephropathy.16 Thus, a balance of the VEGF system seems to be important for glomerular function and glomerular endothelial cell regeneration. Guba et al.17 showed that VEGF secretion is inhibited by sirolimus treatment. As an experimental approach to mTOR-I–related proteinuria, we chose the renal mass reduction rat model to mimic a situation of renal insufficiency and proteinuria, glomerular sclerosis, and interstitial fibrosis. In this model, initial proliferation and glomerular hypertrophy are followed by renal fibrosis.14,18,19 The aim was to evaluate the influence of treatment with sirolimus, initiated after onset of proteinuria, on the further development of proteinuria in a model of reduced renal mass. Further objectives were the evaluation of the influence of sirolimus on the histology and on the renal VEGF system. Thirty-one animals reached the end of the study and were completely analyzed (sham rats that received vehicle, n = 8; nephrectomized rats that received vehicle, n = 7; sham rats that received sirolimus, n = 7; nephrectomized rats that received sirolimus, n = 9). Nine animals were lost either during the operative procedures or shortly thereafter without ever receiving sirolimus. The whole-blood trough concentrations were 38.8 ± 7.9 and 33.7 ± 5.3 ng/ml in the sham rats that received sirolimus and the nephrectomized rats that received sirolimus respectively (NS). Creatinine clearance was markedly reduced after renal mass reduction compared with sham-operated control rats. The values of creatinine and creatinine clearance are given in Figure 1. The treatment with sirolimus had no influence on creatinine or creatinine clearance, neither in the sham-operated rats nor in the rats with renal mass reduction. Creatinine clearance normalized per body weight. Values for sham-operated rats are represented by squares: ▪, vehicle treatment; □, sirolimus treatment; values for rats with reduced renal mass are represented by triangles: ▴, vehicle treatment; ▵, sirolimus treatment. The creatinine clearances of sham-operated rats were significantly higher regardless of treatment with or without sirolimus. Sirolimus treatment alone did not have any influence on creatinine clearance. Proteinuria was observed as early as 3 wk after renal mass reduction and increased to 66.9 ± 33.3 mg/d urinary protein excretion at 5 wk after nephrectomy in both groups with nephrectomy, whereas it did not change in the sham-operated rats. Values of proteinuria are given in Figure 2. 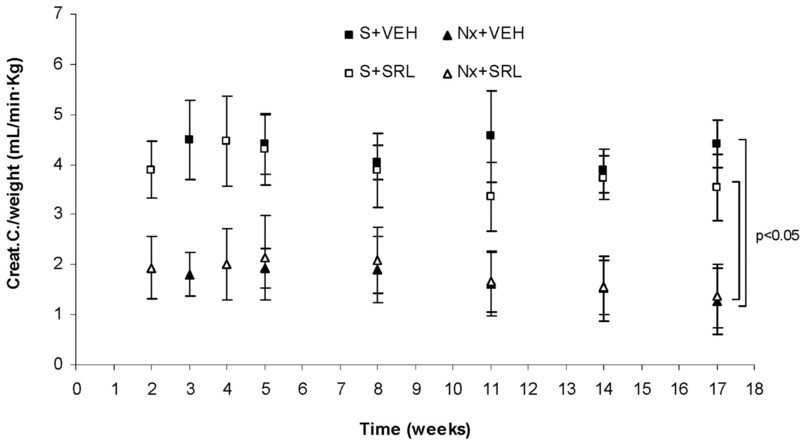 Rats that received nephrectomy and sirolimus experienced no further increase of proteinuria after week 6, whereas vehicle-treated rats doubled the amount of daily urinary protein excretion until the last follow-up at 12 wk after initiation of treatment (Figure 2). Treatment with sirolimus inhibited the progression of proteinuria in rats with reduced renal mass. *Significantly different versus sham-operated rats; #significantly different versus vehicle treatment; *#P < 0.05; **##P < 0.01; ***###P < 0.001. The glomerular diameter was increased in rats with renal mass reduction in the vehicle group (0.11 ± 0.007 versus 0.18 ± 0.02 mm; P = 0.001) as well as in the sirolimus group (0.11 ± 0.007 versus 0.15 ± 0.01 mm; P = 0.003). The glomeruli of rats with reduced renal mass and sirolimus treatment were significantly smaller (P = 0.004). The results of the evaluation of tubular atrophy, interstitial fibrosis and inflammation, and glomerulosclerosis are given in Table 1. The nephrectomized rats that received vehicle showed severe tubular atrophy, interstitial fibrosis, interstitial inflammation, and glomerulosclerosis. In the nephrectomized rats that received sirolimus, the total number of sclerosed glomeruli and the severity of segmental glomerulosclerosis were significantly reduced (Figures 3 and 4). The degree of tubular atrophy, interstitial fibrosis, and inflammation were also significantly reduced in the nephrectomized rats that received sirolimus compared with the nephrectomized rats that received vehicle. 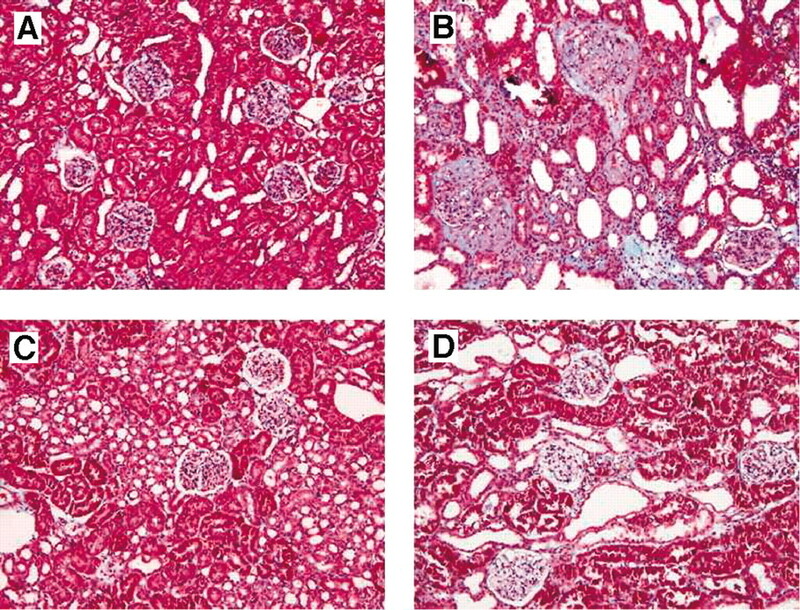 Trichromic stains of a representative kidney of rats with sham operation and vehicle treatment (A), renal mass reduction and vehicle treatment (B), sham operation and sirolimus treatment (C), or renal mass reduction and sirolimus treatment (D). Magnification, ×100. Incidence of glomerulosclerosis as different grades of severity of segmental glomerular sclerosis ranging from unaffected glomerular to complete sclerosis. Sham-operated rats did not show any affection of glomeruli. More than 30% of the glomeruli of vehicle-treated rats with renal mass reduction showed severe segmental or total sclerotic lesions. This effect was significantly attenuated by sirolimus treatment. Urinary VEGF concentrations normalized for urinary creatinine are depicted in Figure 5. The urinary VEGF concentrations were significantly reduced by renal mass reduction in the vehicle-treated group (sham rats that received vehicle versus nephrectomized rats that received vehicle 0.05 ± 0.02 versus 0.02 ± 0.01 pg/mg creatinine; P = 0.007). 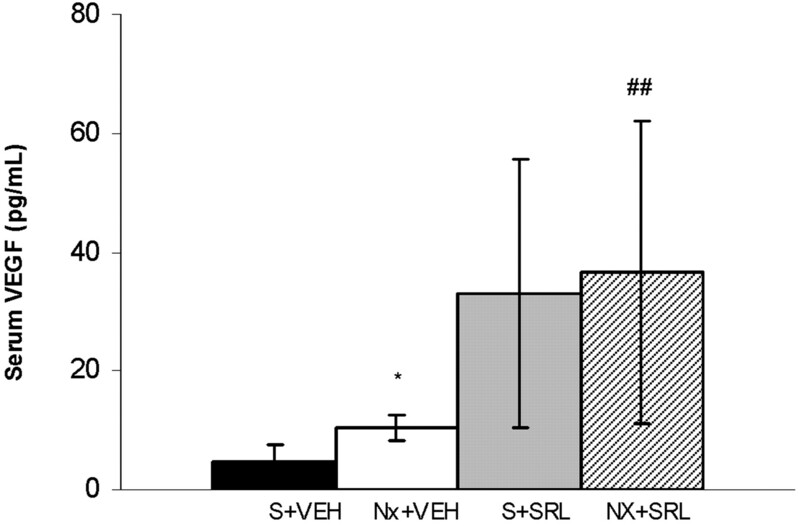 Sirolimus treatment numerically increased the urinary VEGF concentrations in sham rats (0.09 ± 0.06; sham rats that received vehicle versus sham rats that received sirolimus; NS). The reduction of the urinary VEGF concentration through renal mass reduction was completely abolished by sirolimus treatment (nephrectomized rats that received vehicle versus nephrectomized rats that received sirolimus, 0.02 ± 0.01 versus 0.11 ± 0.09; P = 0.006). Urinary VEGF concentrations normalized for urinary creatinine concentration. *Significantly different versus sham-operated rats; #significantly different versus vehicle treatment; **##P < 0.01. 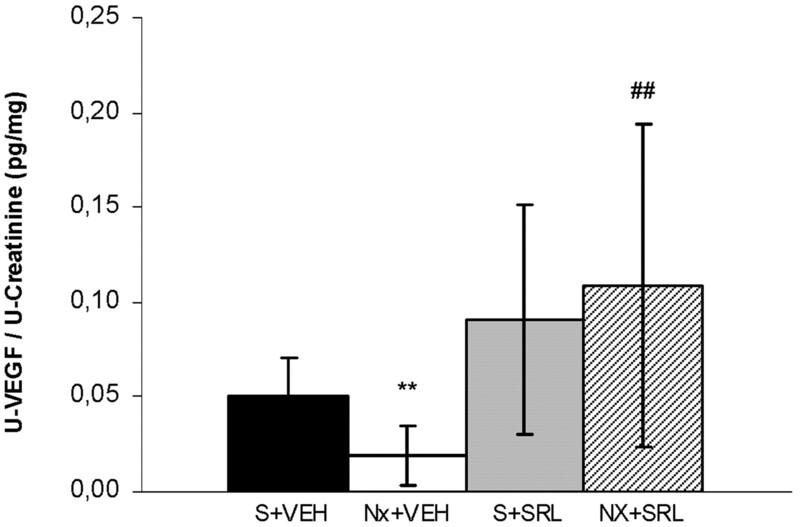 Serum VEGF concentrations were increased in vehicle-treated rats with renal mass reduction compared with vehicle-treated sham rats (sham rats that received vehicle versus nephrectomized rats that received vehicle 4.8 ± 2.8 versus 10.4 ± 2.1 pg/ml; P = 0.014; Figure 6). Sirolimus treatment led to a numerical increase of serum VEGF concentrations (sham rats that received sirolimus versus nephrectomized rats that received sirolimus 33.0 ± 22.5 versus 36.7 ± 25.5 pg/ml; NS); however, this difference reached statistical significance only in the comparison of the groups with renal mass reduction (nephrectomized rats that received vehicle versus nephrectomized rats that received sirolimus; P = 0.006). Serum VEGF concentrations. *Significantly different versus sham-operated rats; #significantly different versus vehicle treatment; *P < 0.05; ##P < 0.01. 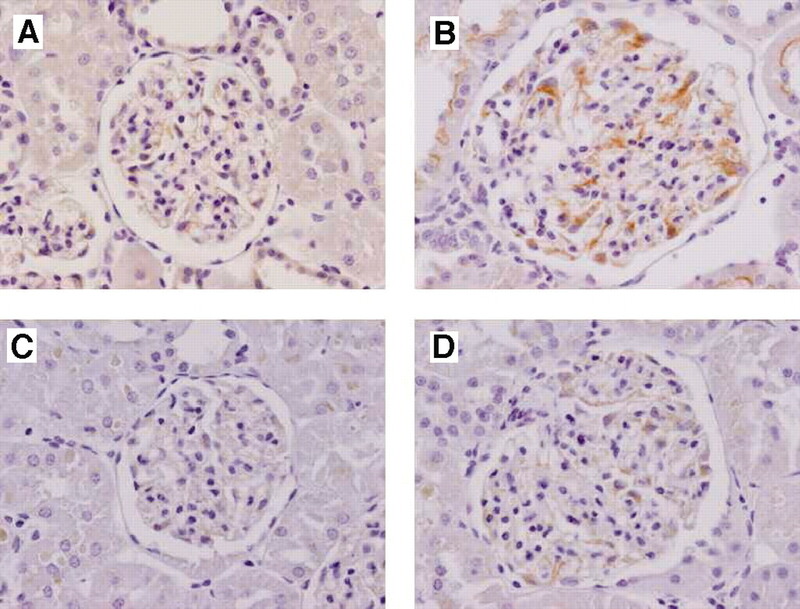 Renal mass reduction was accompanied by an increase of glomerular VEGF expression in the immunohistochemical analysis in the nephrectomized rats that received vehicle (intensity of glomerular VEGF staining: sham rats that received vehicle versus nephrectomized rats that received vehicle: 1.6 ± 0.7 versus 2.6 ± 0.5; P = 0.009). 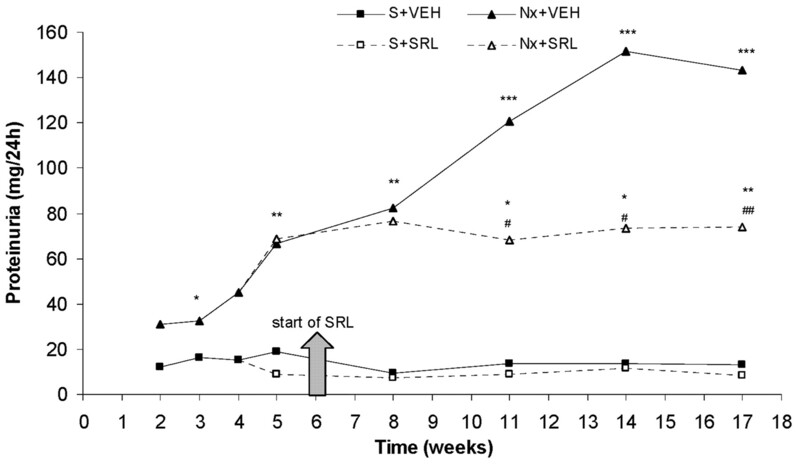 Sirolimus treatment attenuated the increase of glomerular VEGF activity in the nephrectomized rats that received sirolimus (sham rats that received sirolimus versus nephrectomized rats that received sirolimus: 1.0 ± 0.0 versus 1.1 ± 0.4; NS; Figure 7). The difference of glomerular VEGF staining between the groups with renal mass reduction was significant (nephrectomized rats that received vehicle versus nephrectomized rats that received sirolimus, P = 0.001). Tubuli of sham-operated rats did not show any VEGF staining at all (Figure 7). Tubular VEGF staining of the nephrectomized rats that received vehicle was more intense than that of the nephrectomized rats that received sirolimus (2.0 ± 0.0 versus 0.6 ± 0.4; P = 0.001). Immunohistochemical stains for VEGF of a representative kidney of rats with sham operation and vehicle treatment (A), renal mass reduction and vehicle treatment (B), sham operation and sirolimus treatment (C), or renal mass reduction and sirolimus treatment (D). Magnification, ×400. Glomerular VEGF receptor 1 staining showed an increased intensity in the nephrectomized rats that received vehicle (sham rats that received vehicle versus nephrectomized rats that received vehicle: 2.0 ± 0.0 versus 2.8 ± 0.4; P = 0.007); however, a decreased intensity in both sirolimus-treated groups (sham rats that received sirolimus versus nephrectomized rats that received sirolimus: 1.2 ± 0.3 versus 1.3 ± 0.5 [NS]; sham rats that received vehicle versus sham rats that received sirolimus: P = 0.005; nephrectomized rats that received vehicle versus nephrectomized rats that received sirolimus: P = 0.002; Figure 8). Tubular VEGF receptor 1 staining was apparent only in the nephrectomized rats that received vehicle. Neither the nephrectomized rats that received sirolimus nor the rats in the two sham-operated groups showed tubular VEGF receptor 1 staining (P < 0.01). 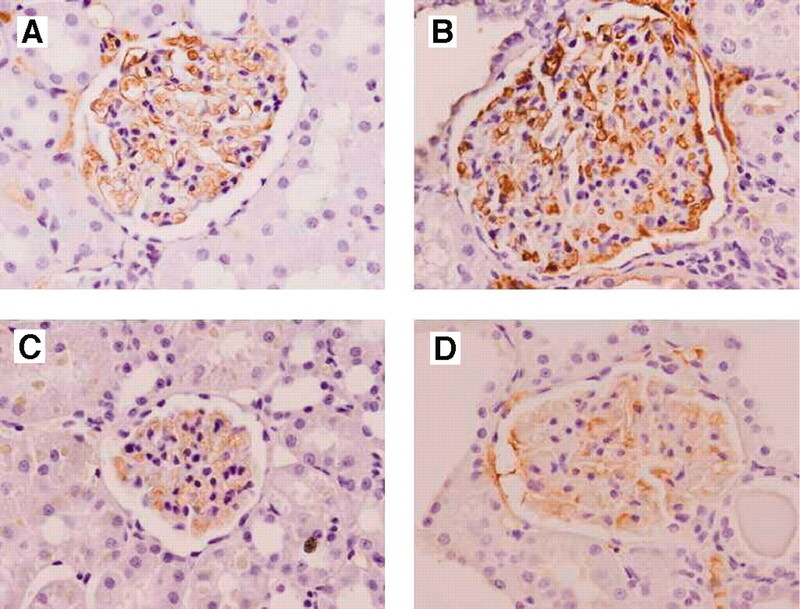 Immunohistochemical stains for the VEGF receptor 1 of a representative kidney of rats with sham operation and vehicle treatment (A), renal mass reduction and vehicle treatment (B), sham operation and sirolimus treatment (C), or renal mass reduction and sirolimus treatment (D). Magnification, ×400. Glomerular staining for the VEGF receptor 2 was markedly increased in the vehicle-treated rats with renal mass reduction compared with sham-operated control rats (nephrectomized rats that received vehicle versus sham rats that received vehicle 2.4 ± 0.4 versus 0.9 ± 0.4; P = 0.01; Figure 9). Sirolimus lowered the glomerular signal of the VEGF receptor 2 in the sham rats that received sirolimus versus sham rats that received vehicle (sham rats that received sirolimus: 0.2 ± 0.3; P = 0.013). 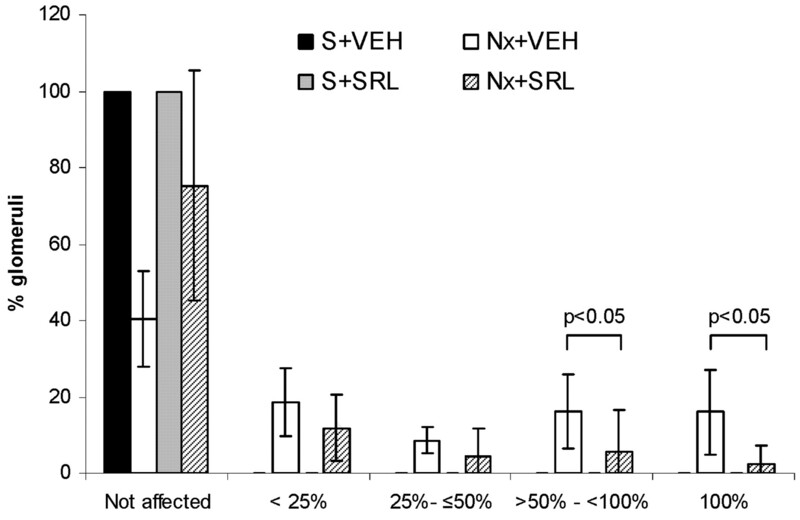 The VEGF receptor 2 intensity was also lower in the nephrectomized rats that received sirolimus compared with the nephrectomized rats that received vehicle (nephrectomized rats that received sirolimus: 1.2 ± 0.27; P = 0.004). 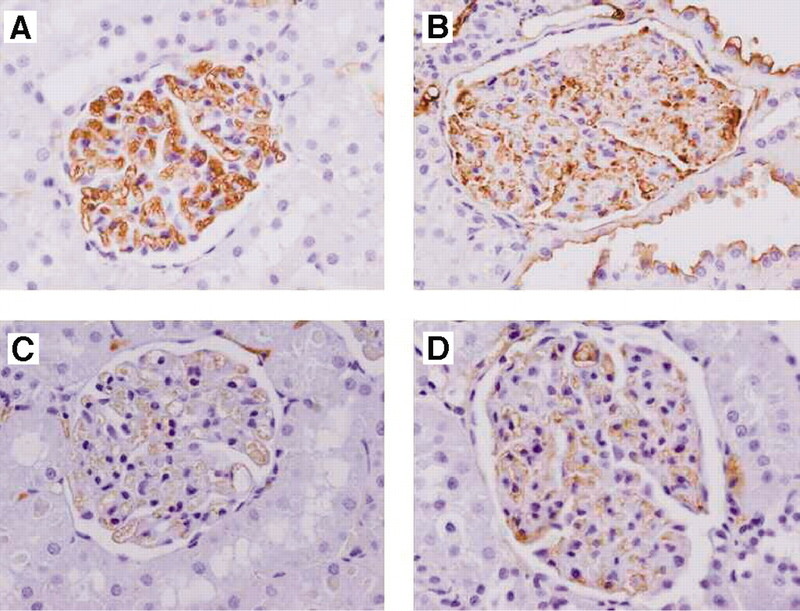 Immunohistochemical stains for the VEGF receptor 2 of a representative kidney of rats with sham operation and vehicle treatment (A), renal mass reduction and vehicle treatment (B), sham operation and sirolimus treatment (C), or renal mass reduction and sirolimus treatment (D). Magnification, ×400. Tubular VEGF receptor 2 staining was increased in the nephrectomized rats that received vehicle (nephrectomized rats that received vehicle versus sham rats that received vehicle: 1.0 ± 0.0 versus 0.0 ± 0.0; P < 0.001). This increase was significantly less intense in the nephrectomized rats that received sirolimus (0.1 ± 0.2; nephrectomized rats that received vehicle versus nephrectomized rats that received sirolimus: P = 0.001). In our model of renal mass reduction, we observed a reduced creatinine clearance and an increase in proteinuria and tubulointerstitial as well as glomerular lesions. To our knowledge, this is the first study showing that the intervention with an mTOR inhibitor after 6 wk when significant proteinuria is already present attenuates the further increase of proteinuria and leads to better renal histology as compared with the vehicle group. The lesions are accompanied by an activation of the VEGF system, which can be partially attenuated by treatment with sirolimus. Sirolimus prevented the further increase of proteinuria. We could further show that sirolimus treatment was accompanied by less interstitial inflammation and fibrosis, less tubular atrophy, and less glomerular lesions after 3 mo of treatment. In a rat model of type 1 diabetes with diabetic nephropathy, Lloberas et al.20 demonstrated the beneficial effects of sirolimus treatment. They showed that low-dosage treatment with trough concentrations of 2.3 ng/ml led to significantly decreased albuminuria. However, in their model, glomerular hypertrophy was not affected by sirolimus treatment. The difference compared with our results, in which sirolimus seemed to protect from glomerular hypertrophy as well, might be the higher sirolimus trough concentration used in our model. Indeed, Nagai et al.21 showed that the AKT/mTOR pathway was activated in the pathomechanism of glomerular hypertrophy in experimental diabetic nephropathy. The achieved drug concentration in our study is high compared with target concentrations in clinical use today. In some clinical trials in the past, similar drug concentrations were used successfully.3 In a recently published experimental model,22 a high intraperitoneal dosage of 2 mg/kg per d (corresponding to a weekly dosage of 14 mg/kg) was applied. We chose an intermediate dosage corresponding to 3 mg/kg per wk. In contrast to our results, Daniel et al.23 demonstrated that a high dosage of the mTOR inhibitor Everolimus, applied early in an anti-Thy1.1 nephritis rat model, increased mortality and glomerular sclerosis, an effect that was not seen by the same authors in low-dosage treatment or when treatment was started 3 d after induction of the lesions. The negative effect of the drug in this model was linked to inhibition of endothelial cell proliferation and reduced VEGF activity. VEGF has also been proposed to play a significant role in the development of glomerular hypertrophy and albuminuria in the model of renal ablation, which could be shown by Schrijvers et al.13 In their study, the administration of a neutralizing VEGF antibody directly after renal mass reduction had a beneficial effect by significantly attenuating the increase of albuminuria and glomerular hypertrophy. In our study, we showed that renal mass reduction led to an activation of the VEGF system (i.e., an increase of the serum VEGF concentration) in the nephrectomized rats that received vehicle as well as a higher intensity of renal immunohistochemical staining of VEGF and its receptors 1 and 2. This was accompanied by a reduced urinary VEGF concentration. Although our study design does not offer an explanation for this, one could speculate that despite a higher VEGF serum concentration and more intense immunostaining, a higher number of active renal VEGF receptors might be able to reduce the urinary VEGF concentration. In our study, sirolimus treatment significantly reduced the immunostaining of VEGF and its receptors in rats with renal mass ablation. In accordance with our findings, Solà-Vilà et al.24 demonstrated that sirolimus reduced the glomerular VEGF protein concentration in the anti-Thy1.1 model. Concerning the influence of sirolimus on VEGF receptors, Guba et al.17 showed that proliferation of human umbilical cord vein endothelial cells as a response to VEGF is markedly reduced by sirolimus, suggesting that sirolimus interferes with the signaling cascade of VEGF receptors. Indeed, mTOR is situated downstream of the receptor in the VEGF signaling cascade,11 suggesting that mTOR blockade could negatively influence the signaling. In our study, the VEGF serum concentration was significantly increased by sirolimus in both the group without and the group with renal mass ablation. Izzedine et al.8 observed a significant increase of the serum VEGF concentration in a renal transplant patient associated with sirolimus treatment. This finding was confirmed by Stracke et al.,10 who detected an increased VEGF serum concentration in kidney transplant patients who were treated with an mTOR inhibitor as compared with patients who received a calcineurin inhibitor. Possibly, the interrupted VEGF receptor signaling cascade might also lead to interference with a feedback mechanism that is implicated in the regulation of VEGF secretion, thereby contributing to higher VEGF serum concentrations. Whether modulation of the VEGF system (e.g., through the use of an mTOR inhibitor) leads to a negative effect, as observed by Daniel et al.,23 or to a beneficial consequence, as observed by Schrijvers et al.13 or in our model, might depend on the type of damage and the timing of the treatment. It is imaginable that VEGF might be needed for endothelial repair for a short period and later exert negative effects in terms of favoring glomerular hypertrophy and fibrotic mechanisms. However, the implication of the VEGF system in different models of disease such as the model of anti-Thy1.1 nephritis23 or of diabetic nephropathy20 or ours might be different and not sufficient to explain the distinct effects of mTOR-I treatment in these different models or in transplant patients. In patients with mTOR-I–associated proteinuria, the VEGF system has been examined only in relatively few cases and never in a systematic manner.8,10 Therefore, prospective studies in humans are necessary to elucidate possible changes of the VEGF system in this context. Our results demonstrate that sirolimus treatment can attenuate the increase in proteinuria and structural damage in a model of renal mass reduction. This effect is accompanied by a decrease in the activity of the local renal VEGF system. Male Wistar rats (Charles River Laboratories España, Barcelona, Spain) weighing approximately 225 g were used. They were kept at constant temperature and humidity and on a 12-h light/dark cycle. The rats had free access to standard rat chow (Harlan Interfauna Ibèrica, S.L., Barcelona, Spain) and water. This study was approved by and conducted according to the guidelines of the local animal ethics committee (Comitè ètic d’experimentació animal CEEA, Decret 214/97). The rats (n = 40) were randomly assigned to four groups. Two of these groups were assigned to undergo renal mass reduction and the other two to have sham operations. Renal mass reduction was performed by cryoablation and subsequent contralateral uninephrectomy after 1 wk, as published by Schrijvers et al.13 The rats of the sham groups underwent surgery at the same time points. These procedures were performed under general anesthesia with isofluorane (Forane; Abbott Laboratories, S.A., Madrid, Spain). After an abdominal incision, the left kidney was exposed and separated from the adrenal gland. The lower and upper poles of the left kidney were frozen by application of a cylinder of dry ice of standard size for 2 min on each pole. Thereafter, the same cylinder of dry ice was applied to the anterior and posterior sides of the kidney. After 1 wk, the right kidney was removed. The rats of the sham groups underwent the same abdominal incision and manipulation of the left and the right kidneys without tissue destruction. All rats received buprenorphine (Buprex; Schering-Plough S.A., Madrid, Spain) at a dosage of 0.03 mg/kg per 12 h for 24 h after surgery. Six weeks after the second surgical intervention, the rats were randomly assigned to receive either treatment with sirolimus (supplied by Wyeth Pharmaceuticals, Collegeville, PA) 1.0 mg/kg intraperitoneally three times per week or vehicle for 12 wk. The vehicle consisted of polysorbate 80 (Sigma-Aldrich, Madrid, Spain), dimethylacetate, and polyethylene glycol 400 (Merck S.A., Madrid, Spain). Sirolimus whole-blood trough concentrations were measured using an HPLC assay coupled to a triple quadrupole mass spectrometer (Quatro Micro; Micromass, Waters, Milford, MA) with a limit of detection of 1 ng/ml and a linearity from 1 to 75 ng/ml. Serum creatinine, creatinine clearance, urinary protein excretion, hemoglobin, triglycerides, and total cholesterol were determined twice before initiation of sirolimus treatment and then every other week by the hospital central laboratory. For collection of urine samples for the determination of creatinine clearance and urinary protein excretion, the rats were housed in metabolic cages separately for 24 h.
At the end of the study, the rats were killed and kidney samples were harvested, fixed in formalin, and embedded in paraffin by routine methods. Hematoxylin-eosin, periodic acid Schiff, and trichromic staining was performed. Segmental and complete glomerular sclerosis was analyzed using a semiquantitative scoring system from 0 to 4 (0, no affection; 1, <25% of glomerular area affected; 2, 25 to 49% affected; 3, 50 to 99% affected; 4, complete glomerular sclerosis). Tubular atrophy and interstitial fibrosis as well as interstitial inflammation were scored from grade 0 to 3 (0, none [<5%]; 1, mild [6 to 25%]; 2, moderate [26 to 50%]; 3, severe [>50%]). Glomerular diameter was assessed by calculation of the mean of diameters of 20 randomly chosen glomeruli per rat. Histologic analysis was performed using a laboratory upright microscope, and diameters were measured using an eyepiece micrometer (BX51 and 20,4-10/100 EYEP.MICRO., respectively; Olympus UK Ltd, Middlesex, UK). At 17 wk after nephrectomy, rats were individually housed in metabolic cages for collection of 24-h urine in iceboxes (dry ice). The urine was defrosted and filtered before it was centrifuged at 2000 rpm (500 × g) for 10 min. The supernatant was used to detect VEGF by ELISA kit (RayBiotech, Norcross, GA) and creatinine for data normalization. VEGF serum detection was determined by Quantikine Rat VEGF ELISA kit (R&D Systems, Minneapolis, MN). Consecutive sections were deparaffinized in xylene, and antigen retrieval was performed by proteolytic digestion with proteinase K for 2 min (Proteinase K ready to use S3020; DakoCytomation, Glostrup Denmark). Unspecific staining was blocked with 3% normal goat sera (S-1000; Vector Laboratories, Burlingame, CA) for 10 min before incubation for 30 min with primary antibodies that were diluted with antibody diluent with background-reducing components (Dako S3022). The primary antibodies used were (1) VEGF, monoclonal mouse anti-rat VEGF (Clone VG1), dilution 1:3000; (2) VEGFR1, polyclonal rabbit anti-rat VEGF receptor-1, dilution 1:5; and (3) VEGFR2, polyclonal rabbit anti-rat VEGF receptor-2, dilution 1:25. All antibodies were purchased from Abcam (Cambridge, UK). Detection was performed using the EnVision system (DakoCytomation) according to the manufacturer's instructions. An isotype-matched control antibody was used as a negative control. Staining intensity was scored from grade 0 to 3 (0, none; 1, mild; 2, moderate; 3, strong). All images were acquired using an Olympus BX51 clinical microscope and DP70 digital camera and software (Olympus, Tokyo, Japan; objective lens, UPlanApo 20/0.70 NA). Statistical analysis was performed using the SPSS 14.0 statistics package. Values are given as means ± SD. The Mann-Whitney U test, Wilcoxon test, or Kruskal-Wallis test was used where applicable. This study was supported by grants from Wyeth Pharmaceuticals, from “Redes Temáticas de Investigación cooperativa V-2003-REDC03,” and from the “Fondo de Investigación Sanitaria, FIS 03/0557.” A.G.D. received a grant from the Instituto Carlos III, Ministerio de Sanidad y Consumo. Parts of this work were published in abstract form at the annual meeting of the American Society of Nephrology; November 14 through 19, 2006; San Diego, CA. We gratefully appreciate the help, advice, and support from Dr. M. Solé and Dr. J. F. Ramírez, Department of Pathology, Hospital Clínic. We also thank Dr. Enrique Granados (Wyeth, Madrid, Spain) for excellent help and support. F.D. and J.R. contributed equally to the study design and preparation of the manuscript.